Polar bears at the Moscow Zoo in 2012. Russian authorities have declared a state of emergency in the remote, sparsely populated Novaya Zemlya islands in the Arctic Ocean, the BBC reported this weekend, after “dozens” of polar bears whose food sources are limited due to climate change started rooting through homes and other buildings near the settlement of Belushya Guba looking for something to eat. According to the BBC, officials said that the bears no longer fear either police patrols or the signals used to keep them away from humans, and that they have even crossed onto the grounds of the local air defense garrison. Though the animals are considered endangered by Russia (the IUCN Red List classifies them as “vulnerable,” with a decreasing population), officials said that if non-lethal means fail to drive the bears away, they may be forced to cull the animals, the BBC added. Videos circulating on social media and posted by the Russia-based Siberian Times appeared to show bears rummaging through parts of the settlement, as well as sort of wandering around and staring at people through windows, though these videos were not independently verified by Gizmodo. However, no order has been given to kill the bears and federal authorities have declined to issue licenses that would allow locals to kill them without legal repercussions. Deutche Welle reported that Russian leadership in Moscow said they have sent a team of investigators to look into the situation, while deputy chief of the local administration Alexander Minayev said in a report to regional officials that some 52 polar bears have been spotted since December, Agence France-Presse wrote. In the past hundreds of disused military structures had to be demolished after the bears took a liking to them, AFP reported, but the current wave is unprecedented. “I’ve been on Novaya Zemlya since 1983 and there’s never been such a mass invasion of polar bears,” local administration head Zhigansha Musin added, AFP wrote. 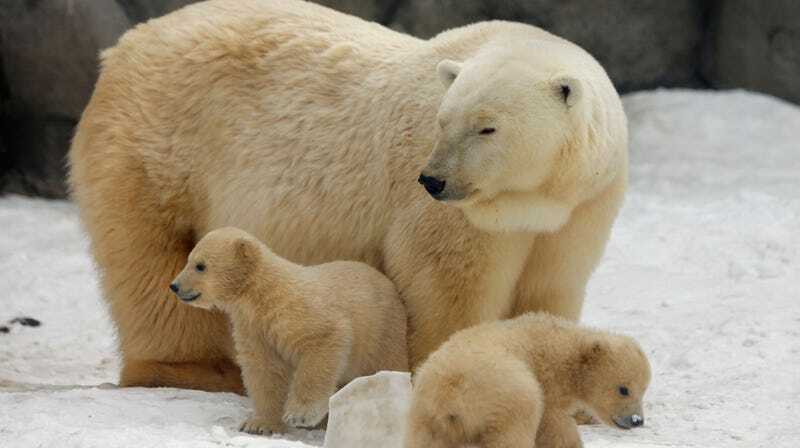 As the New York Times reported in 2017, the worldwide population of polar bears (estimated at 26,000 or so) is expected to decline due to climate change. The bears use ice to hide themselves while hunting seals, their primary food source other than scavenging. But warming temperatures mean ice that melts quicker and earlier in the warm season, depriving them of food and forcing them to hunt on land. Some populations have remained relatively stable, the National Post wrote in 2017, but others are getting hammered. Some research has painted a grim picture, with the species’ outlook heavily influenced by whether humans stop contributing to climate change.